Well, tonight is the night where Carrie Underwood, Audra MacDonald, Christian Borle and company take to the stage in the first ever live televised production of the Sound Of Music. NBC is taking a big gamble on this production but all I have to say is kudos to them for trying to bring back another form of live entertainment. After seeing countless productions of The Sound Of Music, I was officially sated with this show – until now. However, my inquisitiveness had less to do with Carrie’s coveted role of Maria – although this is more than enough reason to tune in. No – for me – it had to do with the fact that this is going to be a live television event. Three hours of live television where anything can happen! And, apparently, NBC is hoping that, if successful, this will become an annual event. From the numerous previews I have watched, Carrie has received superb direction and her voice sounds absolutely wonderful in the role. I am concerned about her more subdued acting ability but the more energetic scenes should be a very honest, genuine and playful experience. Vocally, this is the direction in which Carrie should be moving. Many years ago, when I heard her perform on Oprah with Michael Buble and Tony Bennett, I felt that her voice was a Broadway diamond in the rough. Well, that diamond has since been polished and refined by her Sound Of Music experience and, if all goes well Thursday evening, all that is left to happen is to watch its stock price rise to mega stardom. If you think she is a big star now – just you wait, Henry Higgins, just you wait!! And, let us not forget the magical voice of Broadway star, Audra MacDonald. She was wisely cast in the role of Mother Abbess and will bring additional credibility and professionalism to this mammoth production. On Wednesday, December 4th, she performed Climb Every Mountain during the annual Christmas in Rockefeller Center. Her performance left no doubt that we are in for a really exciting and entertaining musical experience on Thursday, December 5th. Are you excited as I? I don’t know about you, but I am setting my DVR so I can tune in to the show with my grandchildren time and again during the Christmas season. 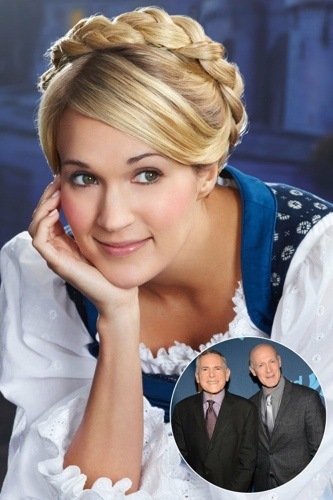 Sound Of Music Live begins on NBC at 8:00 PM on Thursday, December 6th. Comment away during the show. It will be too much fun! First of all thank you so much for posting this lovely piece. I have no worries whatsoever of Carrie and this role. I feel her acting will just fall right into place with this character. Carrie makes a great Maria. What I admire so much about this true one of a kind is that she throws herself into everything that she does. And lord knows she is one of the best live singers out there today….. I have so much respect also for her cast peers who have had nothing but great great things to say about her…..
Richard. Thank you. It was a pleasure and privilege to add this topic about Carrie’s upcoming performance in The Sound Of music this evening. And you pointed out a couple of things that I neglected to mention about her professionalism. She is an astounding and accomplished live singer and one of the most disciplined and meticulous artists in the business today. She has a strongly ingrained work ethic which I have always admired. And that round mouth – so important for resonant and centred vocal delivery – is still ingrained in her vocal regimen. Love her! Yes Audra MacDonald sang last night and it was stunning in my opinion. Can’t watch live tonight but have set my DVR! Thank you for posting this. I don’t normally check tv guide every day and I wouldn’t haven’t known about it if I hadn’t checked your blog. I will most certainly watch. I am a little skeptical though, but I hope I’ll like it still. But to me, The Sound of Music is one of those old musicals that are almost operettas, so I like a classical voice sound in it like Julie Andrews’ – the sound of Broadway before microphones were introduced there. I just am not sure I’ll like a more pop sound in this musicals, but who knows, Carry may win me over. I will watch anyway. You did post an article about this, didn’t you? A very nice one I might add. I only had time for the first half of the production last night, but what I saw was very well done and enjoyable to watch. I’ve recorded the rest for later. I’m glad that a network would take a chance on a three hour live production in this time of extremely close budgets. Given the copycat nature of television networks, this may be a good indication of what may come in the future from the other networks. I think Carrie did a nice job in the role of Maria and as you said, she is known for her work ethic. The producer of her first album after winning American Idol said she was a delight to work with. She always arrived early at the studio, was well prepared and laid down many of her vocal tracks on the first take. I’m sure she approached this project with the same enthusiasm. I’m not sure that this project could have been successful in terms of viewership without a chart topping popular music artist in the lead role. It’s funny the sense of pride that you have when one of the AI alumni do well. They become almost like your children. That’s the magic that the competing shows have yet to capture. Watched last evening and thoroughly enjoyed it! !